AME Church Missouri Conference Choir sings at the 2012 9/11 Interfaith Memorial in Music at The Sheldon. St. Cecilia Church Combined Spanish Choirs, sings at the 2012 9/11 Interfaith Memorial in Music at The Sheldon. Dickson String Quartet, presented by the St. Louis Symphony Community Partnership Program. Presentation of colors by Pipe & Drum Corps of the City of St. Louis Fire Department and St. Louis County Police Department. 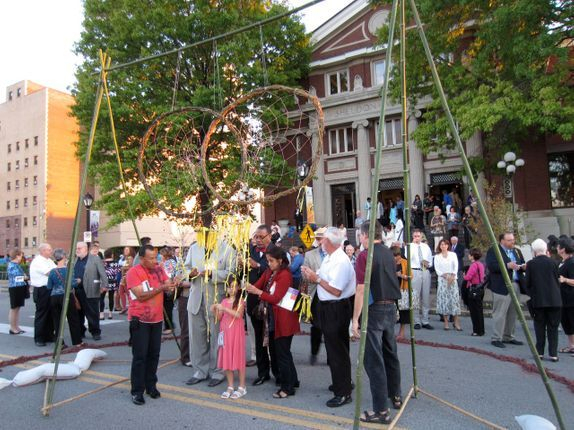 St. Louis artist Lindsey Scott created a large scale interactive community art piece, 'The Unity Web,' to which the audience were able to attach prayers and/or messages of peace and unity written on ribbons after the event. In Lindsey's words: On receiving the call for art that celebrates religious diversity, the web of life came to my mind’s eye. "When we try to pick out anything by itself, we find it hitched to everything else in the Universe,“ says John Muir. To me, the creation is a physical invitation to work on our religious togetherness-in-process. You + Me. Self + God. Dark + Light. Known + Unknown. The weavings filled two interconnected circles, a Venn diagram, with the space between left empty. The mystery, divine silence, inhabits the void. We ask for divine surprise to fill this space between and bring together people from all religious traditions of the world. The ribbons, held in each of our hands, tied on to stand in for each individual’s commitment to walk into this work. May the unity web be an image that guides our community to appreciate the beautiful peace weaved together by Arts & Faith St. Louis and the Interfaith Memorial in Music.